If it Doesn’t Fit, Don’t Make it Fit! Life’s first lessons. Take a reminiscent moment to reflect back to when you are a small child playing with those shaped block toys. 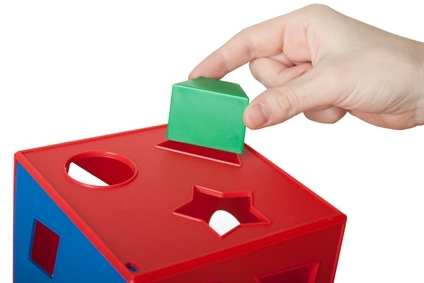 You know… the one where you had to fit a shaped block into it’s corresponding shaped hole. Unless you were the hulk as a child, no matter how hard you tried, the triangle wasn’t going to fit into the square hole. Well, believe it not, this early lesson has a real world electrical application. Circuit Breakers are not one size fits all. Take a look at the photo to the left. You can see that the back of these two breakers have two completely different slots. These slots go into a buss that is designed specfically, and exclusively for their corresponding breaker. Unfortunately, unlike the blocks, it is possible to install a breaker on a buss that it is not designed for. Don’t Make it fit. Now look at the photo on right. Notice how there are several brands of breakers and they all look out of place? Well, they are! These breakers do not belong in this panel and they are loose, and have poor connections. Poor connections with electrical equimpment can cause arcs, sparks, and possibly a fire. Panel manufacturers warn against this on their label. Generally, if you have for example, a Square D panel, you can only use Square D breakers. However, using the same brand doesn’t always yield the correct results. Most manfactuers will list all of the models of breakers that can be used with the specific panel. Not all of a manufacturer’s breakers, will fit into all of their panels. Take a moment and go to your electrical panel. Open it and look at the brand on the label. Look for the section that lists what breakers can be installed in the panel. (Do not remove the cover) Some companies own two brands so you may see two brand names. Start at the top breaker and work your way down ensuring that all of the breakers are the appropriate brand. If not, call an electrician.